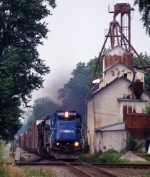 Description: Conrail unit leads an eastbound Stack train on NS's Memphis District. Description: Ex-CR C39-8 leads everybody's favorite southbound. 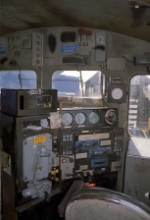 Description: Inside the cab of this former Conrail GE C39-8. Description: A pair of former Conrail General Electric Dash 8 units in Oak Island yard. Description: A rare ex-Conrail horse eastbound with a different view of Cleveland's skyline, note the mix-n-match number boards. Description: Racing down the triple track. The train with the C39-8 was slowly overtaking the other. Description: 21M hustles westbound out of the sun behind four units including an exConrail and a BNSF. Description: NS' 8203 & 2570 waits @ a pair of signals in ELMIRA. This is from a street next to the tracks. Description: A night shot of this former Conrail C39-8. Description: After coming into Croxton as the NS 32A trailing unit, this former Conrail C39-8 spends the night on the Croxton engine tracks. Description: The PRR 8203 sits on the Croxton engine tracks with the PRR 8352. Description: This reactivated C39-8 still wears its dress blue. Description: The engineer's side of this former Conrail C39-8. Description: A side view of the front of this former Conrail C39-8 working at Croxton Yard in Jersey City, NJ. Description: An assortment of locomotives gathered at Enola Yard. Description: Four C39-8s were seen sitting at the Enola Yard engine tracks alongside an ex-high hood GP38-2. Description: Some C39-8's and other assorted junk sitting in Enola. Notice the OLS train in the background. Description: 4 of the C39-8s that NS has been storing are under the old catenary towers.